Himali de Silva and Sue Williams visited Ryazan in March 2011, read their account of this fast paced and hugely successful trip……. 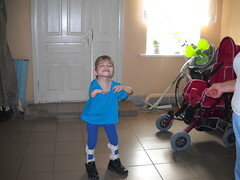 “> This was our initial visit to Ryazan (and our first ever visit to Russia) aimed at conducting a needs analysis as well as carrying out urgent intervention for children with feeding difficulties. 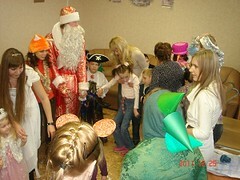 The main venues of the visit were Ryazan Baby Home and community visits with portage workers. In addition, we carried out video-based assessments of selected children from Yelatma. 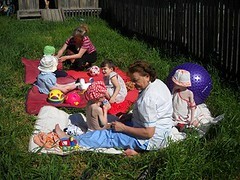 On our first day in Ryazan, we visited the Baby Home. We met Olga Miroshikina, Senior Portage Worker who outlined the plan for the day and what her expectations were from our visit. She identified three groups of children she wanted training in, namely assessment and management of feeding difficulties in children with (1) Down’s Syndrome (2) Cleft lip and palate (3) Cerebral Palsy (CP). We discussed with her that our plan was to cover feeding difficulties associated with CP in detail, as initially requested. Olga however, was keen that we addressed all three groups of children, as she wanted her staff to be prepared to work with any child who may come to the Baby Home in the future with these conditions. We were then taken around the Baby Home and introduced to other Portage workers, some of whom were with children during their Portage sessions. This was most enlightening as it gave us insight into how staff and children interacted with each other. In addition it also gave an opportunity to meet the staff and find out about their expectations about our visit informally. We asked Olga if we could observe the children at mealtimes and she arranged for us to see two groups of children having their lunch. 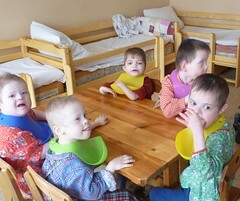 In the first group the children were sat together at small tables and fed themselves (where possible). One child was sat on a small table and was fed by a Portage worker. The child was being fed a soup of mixed consistency (watery fluid with small pieces of vegetables/meat in it). The child coughed repeatedly post-swallow. We requested that the Portage worker fed the child the fluid only (without the bits). The child continued to cough. We then requested the child be fed some of the vegetables from the soup, mashed with the back of the spoon. The child stopped coughing. The purpose of this stepwise exercise was to demonstrate to the staff that (a) coughing was a sign of risk of aspiration (b) how to problem solve and arrive at a safer way to feed. The staff then offered the child a meal of sticky rice with custard, which was a safe consistency for the child. We recommended that the child not be given thin fluids but suggested some ways of thinning thicker consistencies down so this would be tolerated better and still provide adequate fluid. Some of the options offered were using fruit pulp or the local yoghurt drink kiffir as an alternative fluid source. Thinning down yoghurt is also an option. Olga said she would take our suggestions to a larger meeting so appropriate products could be purchased or altered. We also saw a group of younger infants towards the end of feeding. The mealtime was calm and well organised. During the afternoon of our first day, we met with Tatiana Gross, the Director of the Baby Home, which was a privilege. We discussed our visit aims. Later that day, we met Maria Michailovna, Senior Portage Worker in Yelatma. She had brought along with her video clips of 7 children from Yelatma having their meals. We went through each of them and discussed possible strategies to make feeding safer and comfortable for the child, while not adding on to the workload of the staff. We were pleased to find that some of the children were positioned appropriately and were encouraged to be independent feeders where possible. The second and early part of the third day was spent visiting children in their homes with the volunteer Portage workers. These visits were extremely useful to gather information about family structure, availability of food and utensils, access to healthcare and attitudes towards disability. 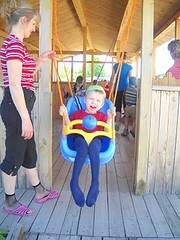 The children selected for our visits presented mainly with CP with additional sensory/behavioural needs. However, their needs and the needs of each of the families were very different. During these visits as well as during the observations in the Baby Home, we collected video material to be used during the training. We used the latter half of our third day to amend our presentations to tailor it as much as possible to the needs of the audience, based on our observations and discussions from the first few days. The training was carried out on the Thursday and Friday mornings as planned. It was attended by approximately 35 participants from Yelatma, Baby Home, University and Portage staff. As planned, we presented introductory training in diagnosis, assessment and basic management of feeding difficulties in children with neurodisabilities. Our overall aims of this initial training were to (1) generate an awareness on feeding and nutritional difficulties (2) discuss realistic strategies in the management of feeding difficulties (3) identify future training needs. As we did not have access to children for hands-on practice of what was learnt during the session, we used video material from the first two days to discuss and problem-solve around issues with feeding. We addressed the specific requests by Olga as well as other participants on Autism, Down’s syndrome and Cleft lip and palate during the final day. The audience participated actively. There were many questions around using oro-motor exercises for developing chewing and speech in children with disabilities. This debate was informative to the extent that it highlighted the training differences in the UK and Russia. We hoped that by the end of the training, we were successful in making the audience consider a cognitive/behavioural approach to therapy. There were also differences in approaches to nutrition which warranted further discussions. The audience also contributed by answering questions and making comments as well as giving examples from their own work. Overall the training went well despite the needs of the participants in the group being quite different. Evaluation forms were given out at the end of the training. All participants found the training useful and were able to see how they would use what they had learnt in their work with children. The views expressed gave us useful information about the participants experiences and what they would like more info on and how they could incorporate what they had learnt into their everyday work and practice. After visiting families with the portage workers in the community and discussing issues with Olga in the baby home (less opportunity with Maria) we felt there was more work which could be done on highlighting the issues and symptoms of children with neurodisability and how this differs from children with autism. The audience also asked for management strategies for children with Autism, for both feeding and communication development. The community visits (we visited 6 families) were very enlightening and were a very good use of time to see the specific challenges for families in Ryazan and the good work Portage workers do. Each family was very different and were very welcoming to the visit asking very appropriate questions which we tried to address. Having the portage worker for the specific family present was very beneficial as this meant they could follow up and monitor the advice given in the future. Learning styles of the audience in Ryazan was different to what we were familiar with. They liked the information to be given as lists and specific points. The idea that management plans are drawn considering the individual requirements of a child created unease. 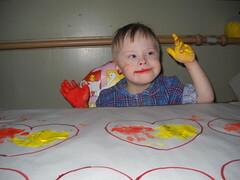 However, having an assessment and intervention format, whereby they looked at each child’s nutrition, hydration, food consistency, utensils, position for feeding and feeding techniques helped to find some middle ground. As a dietitian and a Speech and Language Therapist, prior to our trip, we were uncertain about our usefulness in the Russian context. This visit to Ryazan helped us to develop and understanding about the strengths and needs of these selected projects. We felt that the level of education of the staff and the availability of basic resources such as access to health care, food and shelter laid the crucial foundation for the next level of work with people with disabilities. The staff were receptive to change and questioned differences with insight. To that end, we hope the outcomes were felt to be as rewarding to our Russian counterparts!